Watch Brooks' first-ever primetime television music special on Dec. 2 at 8/7c on CBS and CBS All Access. The best-selling solo artist in United States history, the one and only Garth Brooks, will premiere his new primetime television special, Garth: Live At Notre Dame!, on Sunday, Dec. 2 at 8/7c on CBS and CBS All Access. The special will capture the award-winning country-music legend while he performs on Saturday, Oct. 20 at the first live concert ever held at the legendary Notre Dame Stadium, located at the University of Notre Dame in Notre Dame, Indiana. "After the sellout, I thought it could not get any more exciting than this," said Garth Brooks, who has received every accolade the recording industry can bestow upon an artist. "Then, CBS calls and in an instant, the show becomes bigger. This changes everything." "We have an amazing history with Garth… we've partnered with him at some extraordinary venues: from the enormity of an aircraft carrier to the intimacy of his one-man show in Las Vegas," said Jack Sussman, Executive Vice President, Music, Specials & Live Events at CBS Entertainment. "Now, we are joining forces to bring viewers Garth at his best—a full-blown stadium-sized event for television from renowned Notre Dame Stadium. Garth Brooks. Notre Dame. Two icons. One night," Sussman added. "It will be a television event to remember." Garth: Live at Notre Dame! is a production of Picture Vision Pictures. Executive Producer is Garth Brooks; Supervising Producer is Jillian Ellis. The special is produced and directed by Jon Smalls. 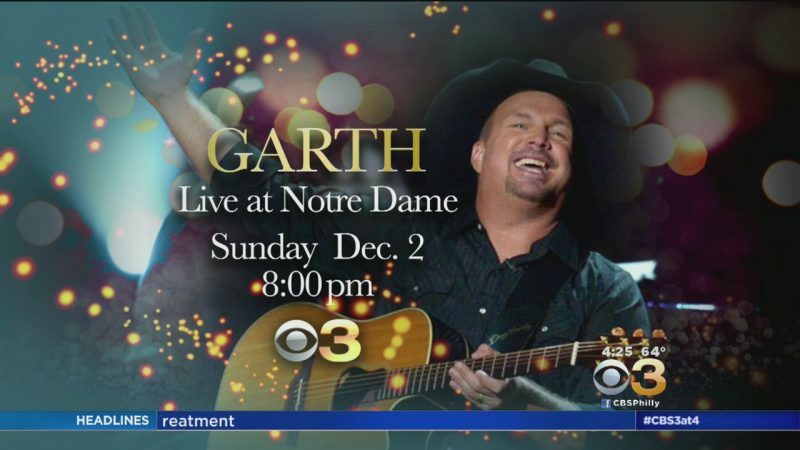 Stay tuned to CBS.com for more information and watch Garth: Live At Notre Dame! on Sunday, Dec. 2 at 8/7c on CBS and CBS All Access.